So much of photography is just timing. There's a time of day called The Golden Hour. It's within an hour of sunrise and sunset. This is the hour when the sun is a bit more muted and turns from a white light to a more golden hue. It makes things just "Pop" more in a picture instead of the "overexposed" tone things can have at midday. With the harvest coinciding with the days getting shorter, the opportunities for finding your own natural fireworks show are all around you. Mother Nature is in bloom and showing off everywhere. I had noticed that the M.E. DePalma Park near the house was getting truly beautiful. Chock full of blooms from native species of plants, this little meadow was showing off to me each time I'd walk past it on my daily routine. I don't have a really high end camera, but I think it did the job that day. 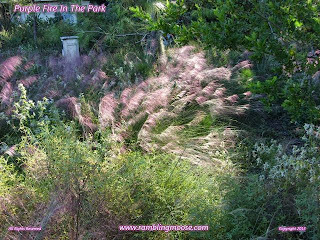 The ornamental grasses that are growing caught the sun lowering in the skies through the slash pines creating a play of dancing shadows and glowing blooms. Yeah, it was that beautiful that day. If you can't get to our own park, grab your camera and head out. The colors are just past peak in the Northeast, but that doesn't mean you can't find your own beauty. In the meantime, this particular picture is in rotation on my background, and there's more to come.